When documents are required to be given under the Common Seal of a local authority, company or other corporate body, the familiar sealing clause should properly be accompanied by a worthy impression of the seal - the hallmark of office from which it emanates. Individual quotes will gladly be supplied on request. Seal engraving has been the art of expert craftsmen for many years; even in modern times there is a continual demand for this service, whether it be for simple wording-only seals or those with full armorial bearings, badges or logos. Assistance is readily given in relation to the type and design of seal and press most suitable for the purpose for which they are required. All presses are available with Centenary finish. Dies and counterparts can also sometimes be fitted to existing presses when, for example, reorganisation has led to a change of name or slight alteration to design. You will find details below of our new and improved range of Corporate Seals and Presses. If you cannot find the information you require, please either view the FAQs, call 01322 621 100, email sales@shaws.co.uk or use the enquiry form on our contact page. For more information on seals styles available please click here. The Brass Wax Seal makes an ideal gift for Christmas, engagements, weddings and anniversaries. Engraved in solid brass with a wooden handle it makes the ideal gift for special occasions. Initials are a very popular choice for wax seals and are available in most fonts including script. If you wish to add your own specific graphic to your seal simply fax or email your design to us and we will provide you with an immediate quotation. *Price depends on whether the seal is wording only, logo only, logo and wordings, type of font, etc. Therefore can only be priced according to design. A lightweight and portable hand held press. Manufactured from mild steel and powder coated in a variety of colours to give an attractive damage resistant finish. In addition, we now supply a version with an all over nickel-plated finish. They come supplied in a neat PVC wallet to prevent damage and easy storage. Interchangeable die sets are sold separately to allow multiple uses from one Plier. SUPPLIED BOTTOM FITTING UNLESS OTHERWISE SPECIFIED. Similar to the Plier seal in its application the Justrite has an interchangeable die format and is supplied in a hardwearing nickel-plated finish. The Desktop Company Seal is more robust than the Plier Press, however, it is still relatively light in weight. Manufactured from case Aluminium and a forged steel handle, it comes in three basic finishes: plain grey, gloss black or centenary finish (high gloss black with gold transfer). 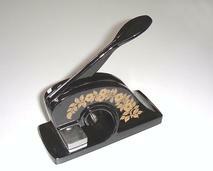 The Notary Seal press gives excellent results with larger impressions and those that include fine detail. Manufactured from cast Aluminium or Iron it comes in three basic finishes: plain grey, black or centenary finish (high gloss black with gold transfer). IDF version for a variety of seals a one press Notory. Strong Steel body and handle with Interchangeable die facility. Manufactured from cast Iron and supplied in standard grey or high gloss black finish. Optional security bolt and lock to prevent unauthorized use of the seal. Manufactured from cast Aluminium or Iron then supplied in standard grey finish. Interchangeable die version for maximum versatility from one press. Manufactured from cast Aluminium with SG Iron lever and supplied in standard grey or high gloss black and gold finish. Optional security bolt and lock to prevent unauthorized use of the seal. The Ambassador is our largest lever press. It is manufactured from cast Iron and comes supplied in standard grey, black or high gloss black and Gold. Optional security bolt in either brass or stainless steel to prevent unauthorized use of the seal. The Regal is our largest press. It is manufactured from cast Iron and comes supplied in standard grey, black or high gloss black and Gold. Optional security bolt in either brass or stainless steel to prevent unauthorized use of the seal. Although traditional in appearance the Regal is still one of the most efficient sealing devices available. Its four start square thread develops a huge amount of sealing pressure. Self-adhesive wafers are available in matt red and are sold in packs of fifty. Three sizes are available - 45mm, 51mm & 65mm diameter. Please note that the 65mm are only available in matt red. Should you have any special requirements please let us know. Mura wax sticks measure 10cm in length and has a taper wick. When using a taper wick wax stick, it must be held at an angle with the point downwards so that the flame rises to melt the wax nearest to the wick. The molten wax drops onto the article to be sealed. When sufficient wax has been applied to the surface, stir with the end of the stick to level, before applying the seal. All prices plus VAT and delivery charge. A letter press in the Centenary finish.